PROTESTERS have vowed to continue the fight against logging at Sylvia Creek, despite a new survey finding no grounds for a contentious coupe to be classified as a Leadbeater's possum habitat. Protests at the Gun Barrel coupe have continued for the past month, leading to 10 arrests of conservationists and local activists. Among them is Steve Meacher, chairman of Healesville Environmental Watch, who last week said he received verbal confirmation that active possum nests were found during a second Department of Sustainability and Environment survey of the area on August 12. But a DSE spokeswoman said there were no live Leadbeater's possum nests in the coupe and that no zone 1A or 1B habitats had been found. She said one tree had been found to contain used hollows but that these did not necessarily belong to a Leadbeater. The tree in question will not be removed. Under DSE guidelines, an active habitat needs to be at least three hectares to qualify. But Mr Meacher said that when endangered species were at stake, a broader view should be taken. "Half the population of Leadbeater's possum were lost in the 2009 fires," he said. "We are looking at the last thousand in the world. Every single animal is important when you get to that stage." About 80 people attended another protest at the coupe last Wednesday. Further arrests had been expected but VicForests told the Weekly logging had been cancelled that day due to wet conditions. Protesters then rallied at the VicForests' headquarters in Healesville. "No one had the courage to come out and answer questions," Mr Meacher said. 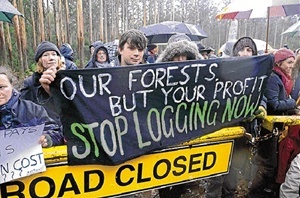 VicForests' operations manager Andrew McGuire said the protesters' behaviour that day was disappointing, with people repeatedly banging objects on office windows. "Staff held fears that the front windows of the office would be smashed," Mr McGuire said. "While we recognise and respect the right of protesters to express their opinions, the behaviour we saw this week borders on intimidation." He said VicForests was committed to engaging in a constructive manner with the community.